Glass never fails to suprise us. It’s a material that you can hold in your hand and can hold up a building, it can be a piece of personal art, or a massive installation of grand proportions. 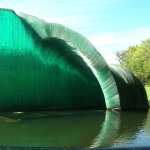 As part of our efforts to share beauty of glass, especially in a month dedicated to glass, take a look at some of the large-scale glass installments that evoke a deep sense of wonderment. 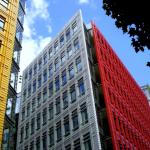 Central St. Giles in London, England: these entirely glass facades that drape the buildings are a departure from the city’s more reserved building features. Cascade at Adelaide Botanical Gardens, Australia: More than 500 glass pieces glued together to create this tidal wave of beauty set in the gardens. 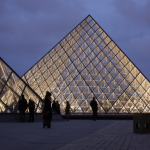 The Louvre, Paris, France: The iconic glass pyramids are some of the most well-known art installations in the city. The Louvre has four of these pyramids, 1 large and 3 smaller ones. 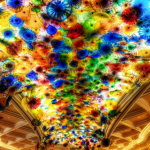 Bellagio, Las Vegas, United States: The world’s largest glass sculpture in the world was created by Dave Chihuly which is on display on the ceiling of the Bellagio in Las Vegas, Nevada. Smaller individual scupltures are displayed together to create this sculpture that seems to extend effortlessly across the ceiling. 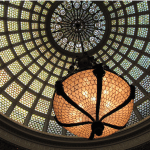 Preston Brandley Hall, Chicago Cultural Center, Chicago, United States: located in the Chicago Cultural Center is the Tiffany’s Largest Glass Dome and Skylight. It is the largest stained-glass domed ceiling in the world. 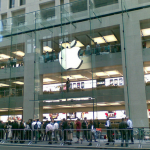 Glass Apple Store, Sydney, Australia: We all know Apple has a knack for the retail and their stores are no exception. While their store on 5th Avenue is the most photograhed location on Flickr, this store in Sydney is a feat unto itself – it features the largest seamless glass panes in the world. 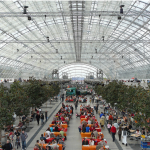 Leipzieg Fair, Germany: This incredible structure, is the largest levitated glass hall, 240 meters long and 80 meters wide, with 1140 tons of glass floating above your head. Have you seen something in glass that amazed you? Share your photo with us!